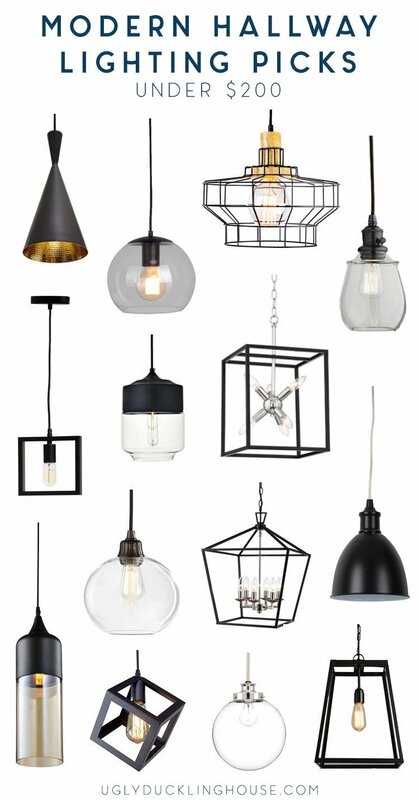 With the master bedroom makeover underway, I’m considering a new pendant light for the hallway that matches the black trim. 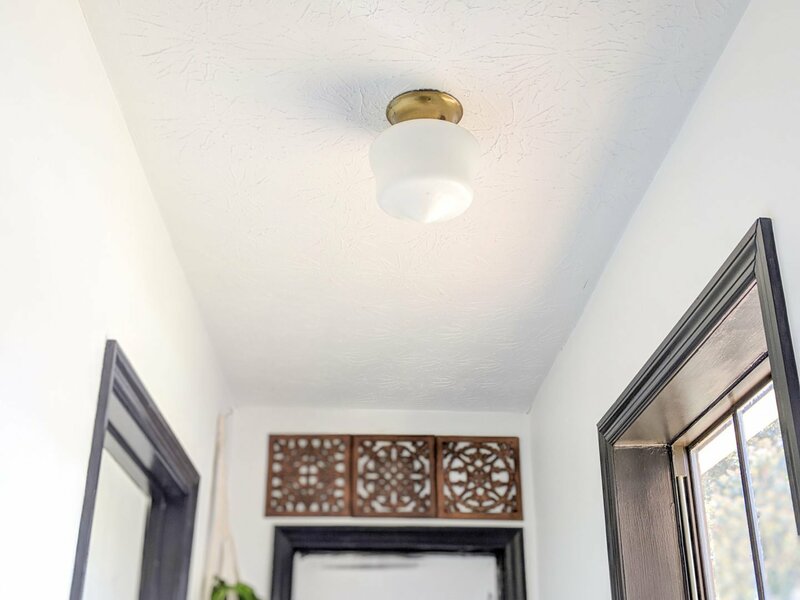 In today’s post, I’m sharing some stylish hallway light options for under $200. As you guys already might know from my last master bedroom update, the main area of the bedroom connects to the master bath and closet with a separate narrow hallway. When I first moved in, the ceiling light was your typical white globe/gumball style, which I updated on the cheap to a schoolhouse style shade a few years ago (you can buy new shades for under $10 at Lowe’s and Home Depot in the lighting area and just swap them out without having to rewire a new fixture — neat, right? Kind of a halfway option if you don’t want to mess with electrical). If I’m honest with myself, it’s a perfectly fine light and doesn’t rank very high on my list of priorities to replace. But, I do love the idea of putting in something on the funky side, especially since I chose a black ceiling fan instead of a dramatic chandelier for the main ceiling light. It would really be the only light fixture in the room where I could have a little fun, so why not splurge a little? Maybe? 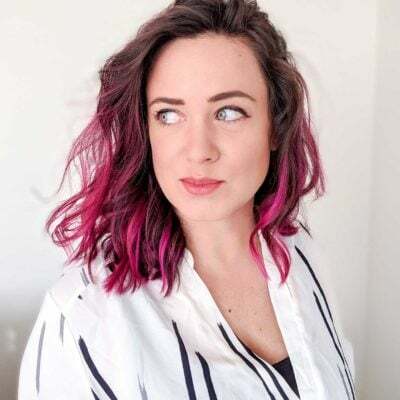 To help make my decision, I’ve created a roundup of some industrial- and modern-inspired lighting options that are still reasonably priced. These are on the small side, so you’d likely find them in a store display for an entryway or kitchen pendant. Many of these come in multiple finishes, but I’m inclined to continue the black accent idea (for more contrast) rather than try to blend it into the ceiling. Which one would you pick? Or would you not switch it up at all and spend the money elsewhere? « Ruby’s Revival: The Vintage Camper Gets a Wash! I’d spray the base of the old fixture black to match the fan and move on, unless a new light fixture really sung in it’s difference. Maneuvering tall things in/out is a concern for me in areas like this. I’d go with a recessed LED fixture. They make ones now that you can place the housing in the drywall (and ok to touch insulation if it’s there) and no attic adventures required. The worries on that is, the stipple ceiling will not let the fixture sit nicely. It will take some work to sand/smooth the edge to prep/install. Then a future swap is more difficult since you’d have cut a larger diameter hole in the ceiling already. I’ve definitely dealt with the ceiling many a time, so I think I’m good with patching, but it’s been pretty rare that I’ve had to when swapping out other light fixtures before! But all good things to think about! Fair! I’ve been considering painting the base and switching out the shade if I find a good one (which seems to be more of a challenge than a whole new fixture, but would probably be cheaper if I found it). I actually really like the idea, but I think if you don’t change it out, it will kind of eat at you until you do it At least that’s how it goes for me. I actually like a few of them, but what about making your own? I think this would look great. (https://www.viewalongtheway.com/2013/01/diy-dodecahedron-pendant-light-and-an-announcement/) And it could be flush mount, so no dangling cord or light to smack your heads on. I love Kelly’s light! It’s definitely a possibility, or some other DIY option could be really cool! But I agree, at the LEAST I think the base needs to be painted and maybe switch out the shade.